This page gives you information on how content and language detection works with Apache Tika, and how to tune the behaviour of Tika. The detect method takes the stream to inspect, and a Metadata object that holds any additional information on the content. The detector will return a MediaType object describing its best guess as to the type of the file. In general, only two keys on the Metadata object are used by Detectors. These are Metadata.RESOURCE_NAME_KEY which should hold the name of the file (where known), and Metadata.CONTENT_TYPE which should hold the advertised content type of the file (eg from a webserver or a content repository). This is provided within Tika by org.apache.tika.detect.MagicDetector. It is most commonly access via org.apache.tika.mime.MimeTypes, normally sourced from the tika-mimetypes.xml and custom-mimetypes.xml files. For more information on defining your own custom mimetypes, see the new parser guide. Where the name of the file is known, it is sometimes possible to guess the file type from the name or extension. Within the tika-mimetypes.xml file is a list of patterns which are used to identify the type from the filename. However, because files may be renamed, this method of detection is quick but not always as accurate. This is provided within Tika by org.apache.tika.detect.NameDetector. By default, the mime type detection in Tika is provided by org.apache.tika.mime.MimeTypes. This detector makes use of tika-mimetypes.xml to power magic based and filename based detection. Firstly, magic based detection is used on the start of the file. If the file is an XML file, then the start of the XML is processed to look for root elements. Next, if available, the filename (from Metadata.RESOURCE_NAME_KEY) is then used to improve the detail of the detection, such as when magic detects a text file, and the filename hints it's really a CSV. Finally, if available, the supplied content type (from Metadata.CONTENT_TYPE) is used to further refine the type. Several common file formats are actually held within a common container format. One example is the PowerPoint .ppt and Word .doc formats, which are both held within an OLE2 container. Another is Apple iWork formats, which are actually a series of XML files within a Zip file. Using magic detection, it is easy to spot that a given file is an OLE2 document, or a Zip file. Using magic detection alone, it is very difficult (and often impossible) to tell what kind of file lives inside the container. For some use cases, speed is important, so having a quick way to know the container type is sufficient. For other cases however, you don't mind spending a bit of time (and memory!) processing the container to get a more accurate answer on its contents. For these cases, the additional container aware detectors contained in the Tika Parsers jar should be used. 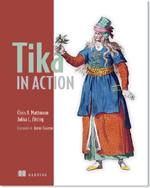 Tika provides a wrapping detector in the form of org.apache.tika.detect.DefaultDetector. This uses the service loader to discover all available detectors, including any available container aware ones, and tries them in turn. For container aware detection, include the Tika Parsers jar and its dependencies in your project, then use DefaultDetector along with a TikaInputStream. Because these container detectors needs to read the whole file to open and inspect the container, they must be used with a org.apache.tika.io.TikaInputStream. If called with a regular InputStream, then all work will be done by the default Mime Magic detection only. Just as with Parsers, Tika provides a special detector org.apache.tika.detect.DefaultDetector which auto-detects (based on service files) the available detectors at runtime, and tries these in turn to identify the file type. If only Tika Core is available, the Default Detector will work only with Mime Magic and Resource Name detection. However, if Tika Parsers (and its dependencies!) are available, additional detectors which known about containers (such as zip and ole2) will be used as appropriate, provided that detection is being performed with a org.apache.tika.io.TikaInputStream. Custom detectors can also be used as desired, they simply need to be listed in a service file much as is done for custom parsers. The simplest way to detect is through the Tika Facade class, which provides methods to detect based on File, InputStream, InputStream and Filename, Filename or a few others. It works best with a File or TikaInputStream. Tika is able to help identify the language of a piece of text, which is useful when extracting text from document formats which do not include language information in their metadata. For more examples of Detection using Apache Tika, please take a look at the Tika Examples page.